Informed and Ready to Act! 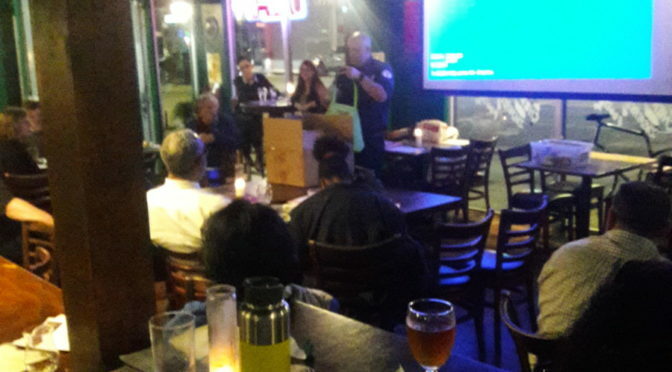 Winter Community Meeting – filled with specific info on our readiness for “the big one”; and the same time we were intro’d to opportunities to volunteer with transformative programming at the LB Public Library and finally the why’s of paying attention as a pedestrian. A new resident to RP Neighborhood remarked “great meeting, it engages us”. Thanks to Joshua and Alana from LBPL, Kenny with our take on the last 6 months of ‘hit-and-run’ actions in RP, and Jake who had us all walk away with a ‘shoe bag’!!! Thanks to Devin Ablard from Council Member Jeannine Pearce’s office, and Council Member Supernaw staying for a few minutes to highlight CD2’s and CD4’s joint effort for the 10th & Orizaba crosswalk improvements. And importantly – Tracy Ames, Red Leprechaun’s proprietor and our friend and neighbor. The City Council just adopted a responsible budget that supports public safety and provides more resources to address homelessness. Buried in the budget, are many investments that don’t get much of attention but make a difference in our neighborhoods. This includes a fund to eliminate the backlog of tree stumps across the city. These stumps are in the public right of way and in neighborhoods and parks. For years the city has cut down dead trees or those damaging roads, sidewalks, and homes and often the stumps were left behind. This budget addresses this backlog and funds the removal of these stumps. If you have a tree stump in your neighborhood that needs removal, please email us at ContactLBPW@longbeach.gov and include “Tree Stump” in your subject line. Be sure to include the address of where the stump is located in the body of your email. We plan to remove all reported stumps over the course of the next year. I want to thank Councilwoman Stacy Mungo Flanigan for partnering on this proposal and her leadership on the Budget Oversight Committee. I look forward to yet another year of seeing our streets, sidewalks, parks and all our city infrastructure improving. Previous PostWinter Community MeetingNext PostWho does all these things around Rose Park?